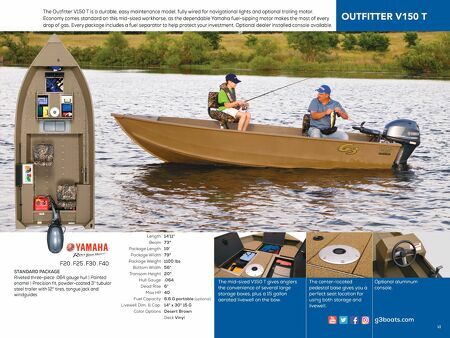 A popular all-season boat for the avid outdoorsman, the Guide V150 T features a three-piece riveted hull with full length keel, marine grade vinyl floor, aerated livewell and a large deck layout with lockable storage. Economical to buy and to use, this easy to launch model is the perfect companion for small lakes and streams. STANDARD PACKAGE Riveted three-piece .064 gauge hull | Painted urethane high-gloss color, unpainted bottom | Precision fit, powder-coated 3" tubular steel trailer with 12" tires, tongue jack and windguides High back fishing seats provide all-day comfort. F20 . F25 . F30 . 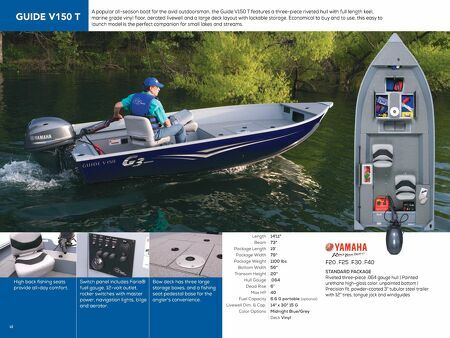 F40 14'11" 73" 19' 79" 1100 lbs 56" 20" .064 6° 40 6.6 G portable (optional) 14" x 30" 15 G Midnight Blue/Grey Deck Vinyl Length Beam Package Length Package Width Package Weight Bottom Width Transom Height Hull Gauge Dead Rise Max HP Fuel Capacity Livewell Dim. & Cap. Color Options 48 Bow deck has three large storage boxes, and a fishing seat pedestal base for the angler's convenience. Switch panel includes Faria® fuel gauge, 12-volt outlet, rocker switches with master power, navigation lights, bilge and aerator.